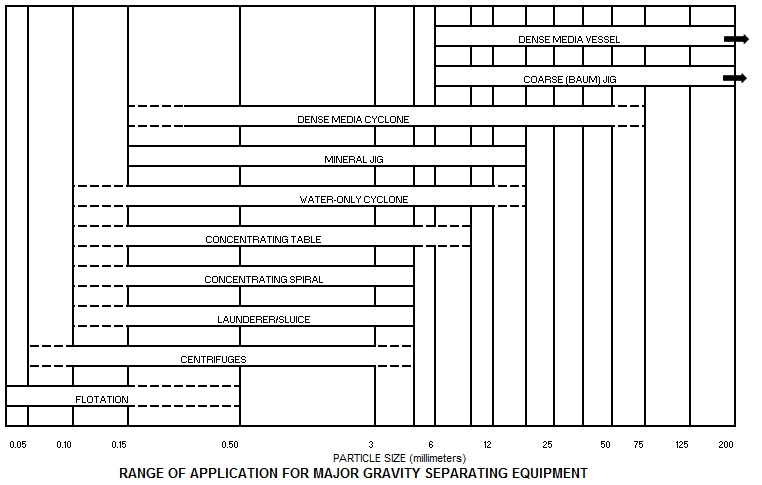 This is an overview of the primary gravity separating devices and how to choose between them. For more details on each device see the referenced article on them. If you are totally new to separating particles by their diference in specific gravity start by reviewing An Introduction to Gravity Concentration, An Introduction to the Principles of Jigging, and Introduction to Flowing Film Concentration. Mineral jigs have been around for a long time, there use was in De Re Metallic by Agricola published in 1556. Jigging has been a widely used means of cleaning coarse coal for more than a century. The first jigs were a basket loaded with mixed particles that was moved up and down in a tank of water. Thus agitated, the particles became rearranged in layers of increasing density from bottom to top. The same principle is used in modern jigs to stratify and separate the products. Jigging can be applied to a wide size-range of particles with top sizes up to eight inches. For more information see An Introduction to Jigs and An Introduction to the Principles of Jigging. Heavy medium separation provides more accurate separation and potential higher recovery \than jigging. The feed is slurried in a medium with a specific gravity close to that of the desired separation. The lighter fraction floats and the heavier fraction sinks. The two fractions are then mechanically separated. While other media have been used, most heavy medium process is separated in suspensions of magnetite or ferrosilicon in water. This suspension is achieved using very finely ground magnetite or ferrosilicon. By varying the amount of media in the suspension, the specific gravity of the medium is changed, which changes the gravity of separation. 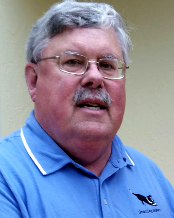 The process is versatile, offering easy changes of specific gravity to meet varying market requirements, and the ability to handle fluctuations in feed in terms of both quan­tity and quality. In practice, feed sizes may range from about k-inch to about six inches. The feed to any particular vessel will cover a portion of this range. For more information see An Introduction to Dense Medium Vessels. For coal and minerals in a size range of 1-3/4 inch to 28 mesh, the heavy medium cyclone is becoming widely utilized. In its operation, a slurry of ore/coal and medium (magnetite or ferrosilicon dispersed in water) is admitted at a tangent near the top of a cylindrical section that is affixed to a cone-shaped lower section. The slurry forms a strong vertical flow and under gravimetric forces, the higher specific gravity moves along the wall of the cone and is discharged at the apex. The lighter particles of lower specific gravity move toward the longitu­dinal axis of the cyclone and finally through the centrally positioned vortex finder to the discharge outlet. The heavy medium cyclone functions efficiently even with large amounts of near gravity material in the feed. For more information see An Introduction to a Dense Medium Cyclone Circuit. Tables have been in use for over 100 years. The basic separating principal is by flowing film (see An Introduction to Flowing Film Concentration). The material to be treated is fanned out over the table deck by the differential motion and gravitational flow, the particles become stratified in layers behind the riffles. This stratification is followed by the removal of successive layers from the top downward by cross-flowing water as the stratified bed travels toward the outer end of the table. The cross-flowing water is made up partly of water introduced with the feed and partly of wash water fed separately through troughs along the upper side of the table. The general application is in processing 28 mesh x 100 mesh material. Due to the nature of the how they operate, it is usually easy to see how well they are working and to make adjustments. For more information see An Introduction to Tables. Research on cyclones led to the development of the water-only or compound water cyclones, which performs a specific gravity separation employing only water and inertia. Its design feature which permits the use of "water-only" is the wide angle or angles in its conical bottom. This promotes the formation of a hindered settling bed, as the dense part­icles move down the side wall. Less dense particles cannot penetrate this heavy bed and move back into the main hydraulic current to be dis­charged out the top of the unit through the vortex finder. Applied in easier cleaning situations than heavy medium devices, water-only cyclones have been used to process material with a top size range of 1-3/4 inch to 28 mesh, generally as a scalping device to reduce the load on other equipment. Water-only cyclones washing 28 mesh x 0 are gen­erally used in coal because of the presence of oxidized coal which has proved difficult to process by flotation. For more information see An Introduction to Water-only Cyclones. Most small particle processing is done in a moving stream of water. This water is used to transport the material being processed and help carry the separated particles away from each other. Launders/Sluices have been used for mineral processing almost as long as jigs (or perhaps longer). They are simple to build and operate, but require a relatively large amount of space for processing anything more than a few pounds an hour of material. Spirals are a more recent development and date from the mid 20th Century (CE). While essentially a spiral launder the force on the particles from the centripatel action enhances separation. For more information see An Introduction to Flowing Film Concentration. Most small particle processing is done in a moving stream of water. This water is used to transport the material being processed and help carry the separated particles away from each other. When processing particles 0.5 mm in size and larger and when there is a large difference in density between the particles, a water based gravity separation process is very efficient. From 0.5 mm to 0.1 mm efficiency drops off, but the devices can still be effective. But, when the particles become smaller than 0.1 mm in size or the density difference between the particles is small, the speed with which the particles will move apart maybe less than the speed at which the water is flowing. This prevents the particles from separating. One solution is to increase the force on the particles by speeding up their movement. Current available technology has increased this force by 5 to 10 times in cyclones. This is a significant improvement, but, still only works for a small range of sizes and densities. Into this area the use of centrifugal concentrators has stepped which can increase the force to 50 to 150 times which is much greater than any other available technology. They can separate particles which were heretofore impossible to separate by other than flotation or chemical processes. For more information see An Introduction to Centrifugal Concentration. In addition to centrifuges, several other technologies have been introduced such as fine heavy media cyclones, and air sparged cyclones to process very fine particles. Fine heavy media cyclones (using ultra-fine ground magnetite) have been used at a plant in Pennsylvania, USA. Fine heavy media cyclones are efficient and work well, but are expensive to install and operate due to the complex nature of the media (finely ground magnetite) recovery circuit. Conventional heavy media uses a magnetite ground to be less than .6 mm, this circuit uses magnetite ground to be less than .1 mm. To reduce losses of the magnetite (reduce operating costs) a special multi-stage media recovery circuit is required. This requires more capital and operating costs than a standard circuit. The circuit is also highly susceptible to fluctuations in the feed. Air sparged cyclones use a fragile, high cost, special gas permeable metal cylinder. Air sparged cyclones are variations on conventional froth flotation. As such they suffer some of the same limitations, i.e., lower efficiency than gravity separation and not all coal is foldable. They both use chemicals and have to have very clean water. The chemical use also restricts the amount of water that can be reused without adding other chemicals. In gravity separation the goal is to separate the particles into groups, those having value and those that do not. The most efficient processing does this by using a natural difference between one particle and another. The relative density of the particles is the easiest to use. For example, coal has a density of 1.5 compared to the non-coal material with a density of 2.3, and gold has a density of 17.6 compared to the average waste of 3.0. For particles whose size is large, this difference is sufficient to allow an easy low cost separating means. When particles become small in size, other factors, such as shape, make this separation more difficult. Processing costs are inversely related to the feed particle size. Coarse particles are easier to process than fine particles. Because of this, most coal is cleaned at the largest size practical. Figure 1 shows the normal range of application of mineral processing equipment. Fine sizes may require multi-stage or sophisticated circuitry. (3) the capital and operat­ing cost that can be borne in a market. Figure 2 – Water Based or Dense Medium? Most process decisions depend on the choice between an all water process and dense medium processes with flotation for the fines. Dense medium involves the use of a fluid that is heavier than the sink material and lighter than the float to assist in the separation. The most common fluid being a mixture of magnetite and water. The Factors shown in Figure 4 normally decided which system to be used. Water Process plants (jigs, tables, spirals, and water-only cyclones) are generally cheaper to install and operate than dense media circuits (dense media vessels and cyclones). They have the added advantage that, quite commonly, they do not require separation of the feed into various size fractions. On the negative side, however, they all have the following disadvantages compared to the dense medium circuits. They produce lower yield for a product grade even in the case of materials which are 'easy' to clean. They generally do not operate well, if at all, at separation gravities below 1.50. In case of 'difficult' to clean materials, they do not operate effectively. The term “Ease of Separation” (Figure 3), is common term used in coal cleaning, but not as common in mineral plants, but the concept is still valid. The ease or difficulty of a separation is defined in terms of near gravity material. This is the amount of material present within +0.1 specific gravity units of the selected separating gravity (which in turn depends on the desired grade and recovery). The separat­ing gravity is the specific gravity at which the device is operated, the difference of actual separation and the “perfect” separation is a measure of equipment performance. For more information see: An Introduction to Gravity Concentration, An Introduction to the Principles of Jigging, and Introduction to Flowing Film Concentration.